Dissertation editing services for the near perfect dissertation! 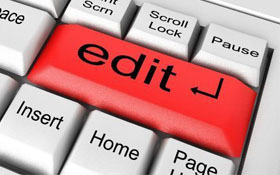 Our copyediting will produce writing that is as close to perfection as possible. We focus on fine-tuning at the sentence level. May suggest rewrites to eliminate awkward phrasing, repetition, excessive passive voice, etc., and to improve transition within and between paragraphs, scholarly tone (such as APA 6th, Chicago, MLA, etc.). The rate for Copy-Editing service is $4.25/page to $7.75/page, depending on writing quality. For a more approximate cost CLICK HERE.